This event has passed, but whoa — this awesome community of stache-donners and -lovers and arm wrestling fans helped raise $5,858 for Habitat for Humanity of Durham’s Women Build. Click here for pics of the event. 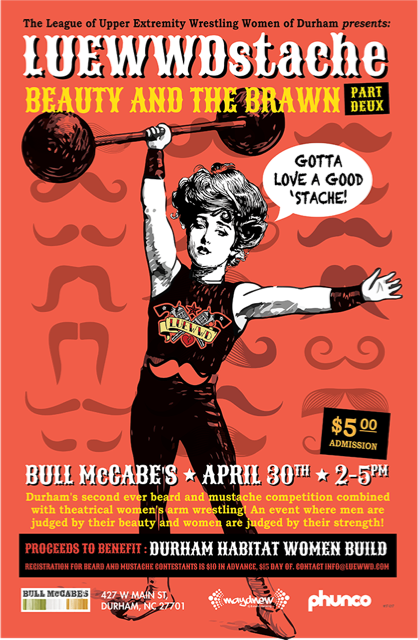 On April 30 from 2-5PM, LUEWWD is partnering again with Bull McCabe’s to bring you LUEWWDstache: Beauty and the Brawn, part deux. Proceeds from this event will benefit Habitat for Humanity of Durham’s Women Build. This event is being sponsored by MAYDNEW DJ and Event Planning, Phunco, Durty Bull Brewing, William Travis Jewelry, NicholsonPham, Urban Durham Realty, Culture Hair Studio, Heather Garrett Interior Design and the Tranquility Company, and an additional anonymous donor. Additional in-kind donations have been provided by Adam & Eve, Carolina Beard Company, and the Scrap Exchange. Join us for a Sunday Funday on the lawn where the beauty of men’s* beard and mustache competition meets the brawn of women’s* arm wrestling! *A note about gender: LUEWWDstache is not HB(eard)2 and we are not policing your pants, just your whiskers – nuff said! For the beauty portion, contestants will compete in the following categories. For the brawn, we will have four women wrestlers competing in an abbreviated LUEWWD bracket. In the LUEWWD, aka Au Naturale Leave your styling aids in your kit. It’s back to basics for these Au Naturale competitors. They can oil it, brush it, comb it, clean it, and condition it but don’t overdo it – the beauty of these facial coiffures is as natural as the feeling you get skinny dipping in the Eno. The LUEWWD Coiffure, aka Styled and Secured A LUEWWDbush and a LUEWWDstache with some, let’s say, enhancements. Contestants can use styling aids to pump up and hold your curlies but no pins, barrettes, or extensions to give the extra boost. LUEWWD Fantasy, aka Facial Art Use your imagination to design either a realistic rendering of a beard and mustache or your fantasy facial art made out of the material you always wanted rubbing up against your cheeks. Best in Show, aka Shake the Moneymaker We will also choose Best in Show from the LUEWWDstaches and LUEWWDbushes in the contest. To win this most coveted prize, you need to be everyone’s favorite…and by that, we mean you need to earn the crowd’s dollars. The contestant with the most money raised by the end of the contestant will win! Registration for beard and mustache is $10 in advance and $15 day of. Register here! Interested in watching? Bring $5 and some friends!